United Arab Emirates in July. DUBAI, United Arab Emirates - Dubai has earned itself an unlikely spot amid the world's ritziest - and priciest - beachside hot spots. Paris Hilton, Lindsay Lohan and David Beckham all have been spotted partying in this opulent Arabian playground, where a poolside beer can easily top $10 and one hotel boasts rooms starting at $1,000 a night. That doesn't mean you need to be a rich oil tycoon to afford this sunny desert boomtown, however. Here are some tips to get you started. And yes, despite the tough neighborhood (across from Iran and down the coast from Iraq), it's totally safe. The blast-furnace heat and humidity make long daytime strolls unrealistic in summer, when the mercury can approach 120 degrees. Even during the pleasant period from October through May, you'll likely need some sort of transport. Until the Dubai Metro opens in September, your best bet is one of the ubiquitous sand-colored taxis. All are metered and cheap by Western standards. Fares start at 82 cents (3 dirhams), but beware the $5.48 (20 dirham) surcharge from the airport. Drivers generally are honest and, like most people you'll meet, speak good English. Another option is a seat on the double-decker buses operated by Big Bus Tours. The hop-on, hop-off tickets are not cheap - a one-day pass costs $60 (220 dirhams) for adults and $27 (99 dirhams) for kids - but the tours are an efficient way to see the sprawling city's highlights. Don't forget sunscreen if you plan to ride up top. Details at www.bigbustours.com/eng/dubai/default.aspx. Dubai is rightly known as an unabashedly modern city of gleaming high-rises and extravagant shopping malls. That makes its rare historical sites all the more special. Take time to stroll the winding streets of the bustling old neighborhoods straddling the downtown creek. Start your visit at the Dubai Museum, housed in the renovated Al Fahidi Fort in the Bur Dubai district. Exhibits depict activities such as pearl diving and date farming that shaped life in the region before the discovery of oil. Tickets are a bargain at 82 cents (3 dirhams) for adults and 27 cents (1 dirham) for kids. 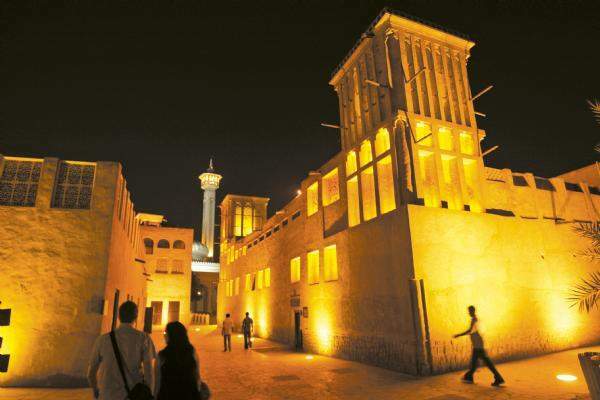 Next, get lost amid the refurbished wind towers and minarets of the Bastakiya quarter's walkable lanes. Then make your way down to the quay, where you can catch a ride on one of the traditional wooden abras ferrying passengers across the creek. A one-way ride costs just 27 cents (a dirham). Or charter your own for $27.40 (100 dirhams) per hour. 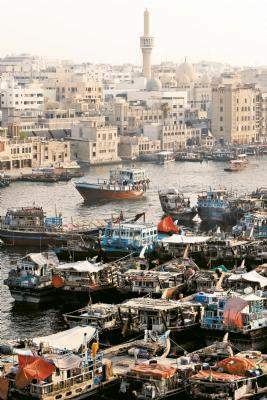 On the Deira side, head to the colorful old souk (market). Follow your nose first to the spice market, where you'll find great deals on saffron as well as non-edible aromatics like frankincense. Continue to the covered gold souk. It's worth a visit just to ogle the wares. If you are buying, ignore the touts at the market's entrance and be sure to haggle hard once inside. Four days a week, the Jumeirah Mosque south of Bur Dubai opens its doors to non-Muslims. Guides from the Sheik Mohammed Center for Cultural Understanding end each 10 a.m. tour with a question-and-answer session about Islam and Arabic life. Women should wear a head scarf, and all visitors must dress conservatively. Visit http://www.cultures.ae/index.php. With little oil of its own, Dubai has staked its future largely on becoming a global marketplace for big (and little) spenders. That makes the city's malls among the world's most incredible. And rambling through their super-chilled corridors doesn't cost a dirham. The brand new Dubai Mall ranks among the world's biggest. Its main draw is a massive aquarium boasting the world's largest viewing panel. There also is an Olympic-sized ice rink, multistory waterfall and recreated gold souk. Oh, and hundreds of shops. Outside is the enchanting Dubai Fountain, which draws big crowds every half hour to watch the must-see evening music-and-light shows. Details at www.thedubaimall.com/en/. Under construction next door stretches the spindly Burj Dubai (Dubai Tower), the world's tallest building. The glass-and-metal behemoth tops out at more than 2,600 feet, though its exact height remains a secret. Sadly, you'll have to wait until the building opens later this year for tours. Farther down the skyscraper-lined Sheik Zayed Road lies the Mall of the Emirates. 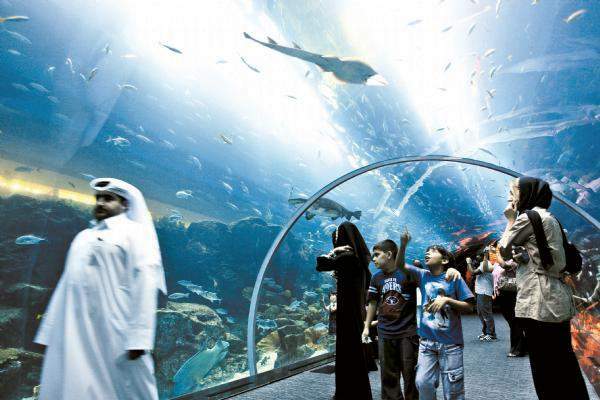 While it's no longer the city's biggest, it still wows visitors with the indoor snow-covered slopes of Ski Dubai. You can watch the chilly action from inside the mall or splurge for a shot at the facility's five runs yourself. A two-hour pass is $49.32 (180 dirhams) with everything but gloves and hat included. Visit www.skidxb.com. Off the coast nearby lies Palm Jumeirah, a man-made island built in the shape of a palm tree. You won't be able to get inside the gated communities on the island's "fronds," but you can take a monorail, round trip $7 (25 dirhams), up to the Atlantis hotel at the island's top. It has an impressive aquarium of its own. Hit the sand without shelling out for a waterfront hotel by joining the locals at one of the city's public beaches. Entry to Jumeirah Beach Park, just down the road from the iconic sail-shaped Burj al-Arab hotel, costs just $1.37 (5 dirhams). Hotels-and-Resorts/Wild-Wadi1/. Prices at Aquaventure at the Atlantis hotel - www.atlantisthepalm.com/aquaventure.aspx - are about the same. For some of the best bird's-eye views of the Palm Jumeirah, head to the Observatory lounge on the 52nd floor of the Harbour Hotel. Here you can watch the sun set while sinking half-priced happy hour cocktails from 5 to 7 p.m. No shorts. The city's many malls offer some of the best deals on quick meals. Besides the usual suspects such as McDonald's and Subway, food courts offer a good variety of Middle Eastern and Asian restaurants. Zaatar W Zeit is a Lebanese chain serving up decent Arabic snacks, while Shamiana is a good bet for Indian food. Downtown, grab a meat-filled shawarma sandwich at any of the hole-in-the-wall shops for under $2 (7 dirhams) or follow the predominantly South Asian crowd to the area's many Indian and Pakistani restaurants. A filling vegetarian thali (platter) costs just $4.11 (15 dirhams) at Saravanaa Bhavan. The Indian eatery has outlets in Deira, Bur Dubai and nearby Karama. Many supermarkets serve a far wider range of prepared meals than you might expect. Takeout Arabic roasted lamb platters, Filipino rice dishes and all-American barbecue chicken are all easy to find. The financial crisis has had the positive side effect of dragging Dubai hotel rates down from the stratosphere. Shop around and you may find you can afford far more luxury than you think. One of the best central options is the Orient Guest House, located in a renovated courtyard building in the Bastakiya area. Bed and breakfast for two can currently be had for as little as $95.90 (350 dirhams) a night. As a bonus, guests can use the nearby facilities at sister Arabian Courtyard Hotel & Spa. , a welcoming if kitschy four-star option in its own right.